“Among the tenement-houses during the heated term—just before daybreak” reads the caption to this 1879 illustration of New York’s poverty-stricken slums in the summertime. Under a gaslight, adults and kids try to catch a breeze and sleep on the front steps of a rundown grocery, as well as on the roof and beside open windows. In July and August, any New Yorker who could left the city for cooler weather in the country. These residents remained behind to deal with the oppressive heat made worse by the airless rooms of tenement flats. They don’t even have fire escapes to sleep on, which 20th century city residents used as beds for hot summer nights. This entry was posted on June 18, 2018 at 5:50 am and is filed under Lower Manhattan. You can follow any responses to this entry through the RSS 2.0 feed. You can leave a response, or trackback from your own site. 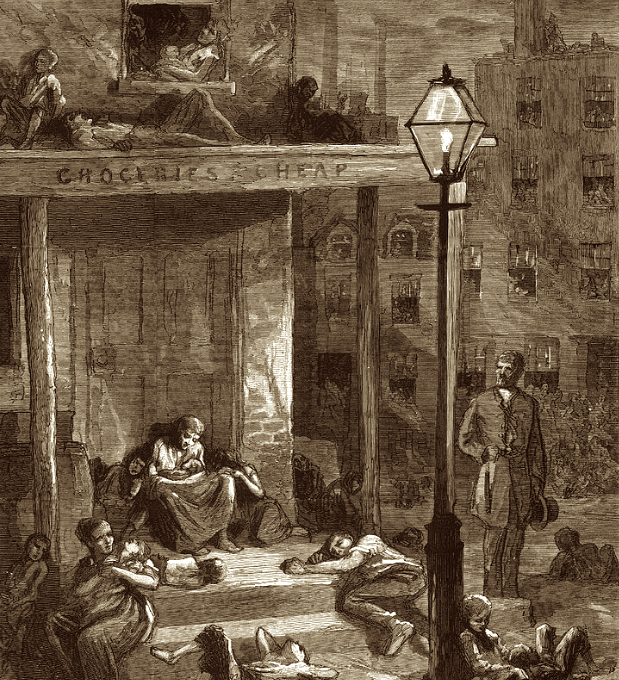 ephemeralnewyork posted: “”Among the tenement-houses during the heated termâjust before daybreak” reads the caption to this 1879 illustration of New York’s poverty-stricken slums in the summertime. A fire in one of those buildings must have been a horror.